Flash is a character I come to and enjoy for some fun adventures, featuring a variety of villains, for faced paced stories that look great. Unfortunately many of the recent issues of this series have suffered from a slow pace, combined with an art style that can never be quite pinned down, while Barry doesn't do much but seem constantly stressed out, never having much fun, or time to crack a joke. However, when I saw Grodd was making his influence known on the long running events in this story line I was all in. So lets peek in on the penultimate issue of this arc, and see what our evil gorilla buddy will do with the Flash family, now that he has control of them all but Barry. As I just mentioned, last issued ended up with Barry using the 'Lightning Wand' to call the Speed Force back to him. Unknowingly to Barry this was at the expense of his family, who's now under Grodd's control because he's more connected and more powerful now ... or the Negative Speed Force ... its not quite clear unless I missed something. Regardless, Barry's use of the 'Wand', and all around unlikablity lately, make him very responsible for the current state of the events concerning 'the family'. This issue picks up with Barry running through the city, being taunted by Grodd, before getting smacked into next week by Godspeed, as his Grodd controlled family catches up to him. 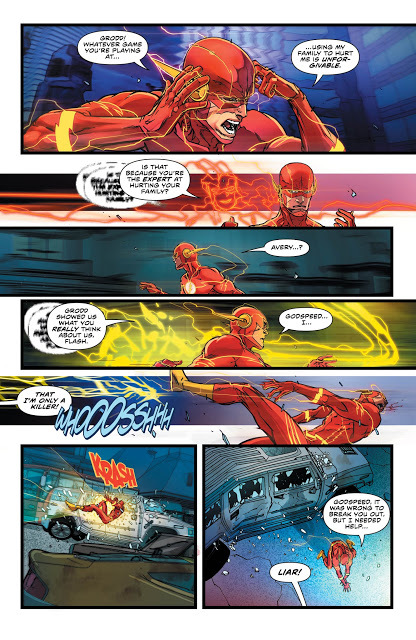 Barry takes the fight on the run again, while (old) Wally gives chase, seemingly able to temporarily break control when Barry brings up Iris. The two Flashes (Barry & Old Wally) exchange words, with Wally only able to squeeze out ... wait for it ... nothing we DON"T already know. 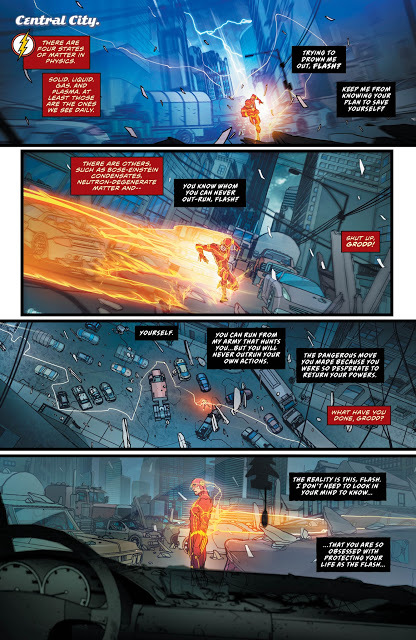 Then its back off to fighting as Old Wally becomes controlled again and drags Barry through the streets, then up and down the buildings, of Central City. 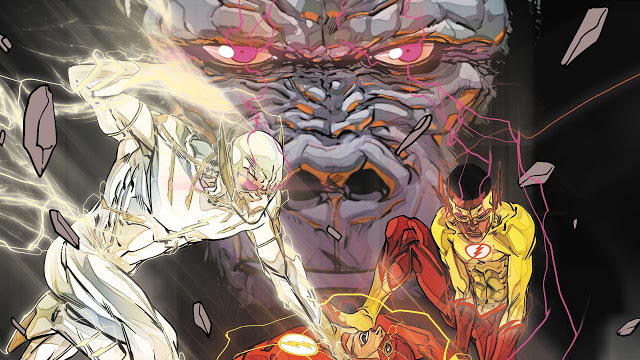 Barry is brought to the feet of Grodd, accompanied by his team Flash he controls, where a final heart to heart between the two long time foes almost concludes our story. Barry ends up revealing all the running throughout the city this issue resulted in his collecting the 'Wand' pieces again. Barry, altering its frequency, jumps at Grodd hitting him with the 'Wand', and curing Grodd of his 'Gorilla Aids' (shout out Jim) but cutting off his connection to the Speed Force, which frees the Flash family, even Mena. Obviously losing to Flash makes Grodd, a normally unhappy being, that extra bit of miserable to really set him off. I guess he didn't want to be cured after all, especially if it resulted in no powers. So good old Grodd attempts to 'turn off'' the lightning rod (according to Mena) which unleashes Negative Speed Force destroying Central City ... somehow, I don't know how the Negative Speed Force works ... because if Grodd cant have power then neither can Central City. Overall, I have very conflicting feelings about this issue, while I don't think it was bad, but I just didn't find it to be as entertaining as a story featuring Grodd should. 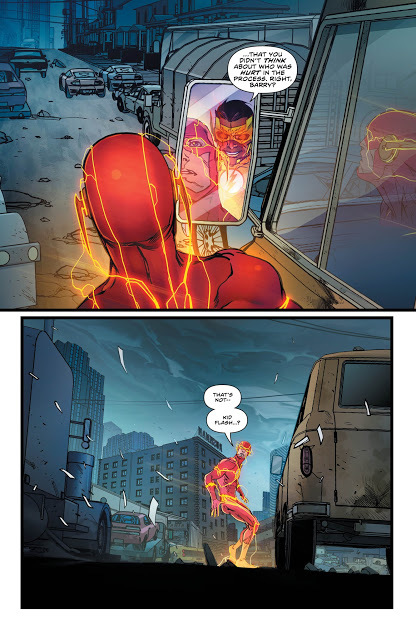 I like Barry coming to the realization that his powers don't make him a hero, its his actions, and Josh Williamson did a good job of conveying that in the dialogue towards the back of the issue but I just don't see this character development sticking around, especially with Flash Wars around the corner. If Barry flip flops by beefing with the family again it would feel like the 5th or 6th time in this series, since Rebirth started, we've tread that water and its getting old. I also don't understand anything about the Negative Speed Force, the 'Lightning Wand', or 'Lightning Rod', and how they each differ, which are all integral to this story, but haven't been built up very well in this stories conclusion. The art was decent and I enjoy Carmine Di Giandomenico, Ivan Plascencia on this title most of the time. However sometimes the character work of certain people featured in the story vary greatly from page to page, especially Gorilla Grodd, which shocks me a bit. I wish this book in general would have a more consistent arc tone and feel overall it just varies so much from issue to issue even within arc and specific trades collected. 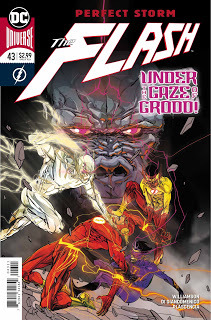 We get an average issue, thats pretty typical of this Flash series and run to date, with one more issue to fill out the arc to come that I'm not over excited for, even with Grodd as our villain. The main story revolves around poorly built devices that move the issue forward with little explanation, rhythm, or reason most times. I just wish Barry wasn't so frustratingly wishy-washy about his family relationships. It feels like he's either mad at, or making up with someone, every issue. I'd recommend this only for serious Flash collectors, or Rebirth series regulars, otherwise wait it out until Flash War hopefully reinvigorates this titles direction. The writer of this book doesn't deserve a visually stunning artist like Carmine. My fireplace enjoys this run and keeps me warm so can't complain.